I LOVE chocolate covered pretzels. So this year I decided to buy some white and chocolate almond bark and try making them. It was so easy. 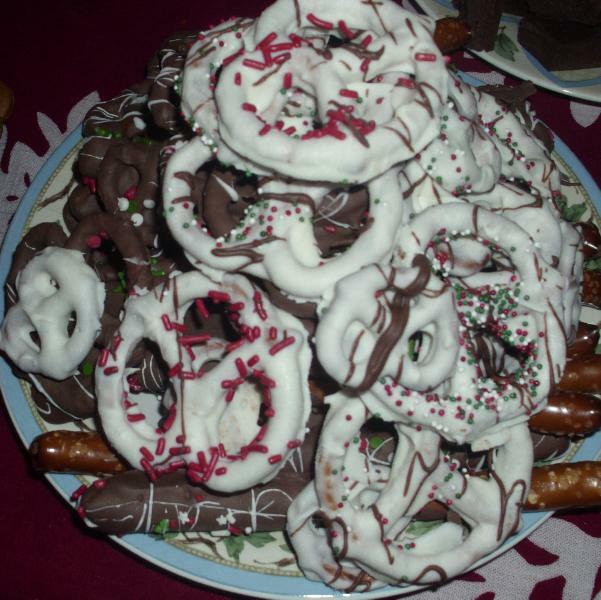 Pretzels - I used assorted shapes and sizes. 1. Melt the almond bark in a large bowl in the microwave. 2. Dip the pretzels in the melted almond bark. 3. Place the coated pretzels on wax paper. 4. Shake some sprinkles on top. 5. Let the pretzels dry and enjoy!